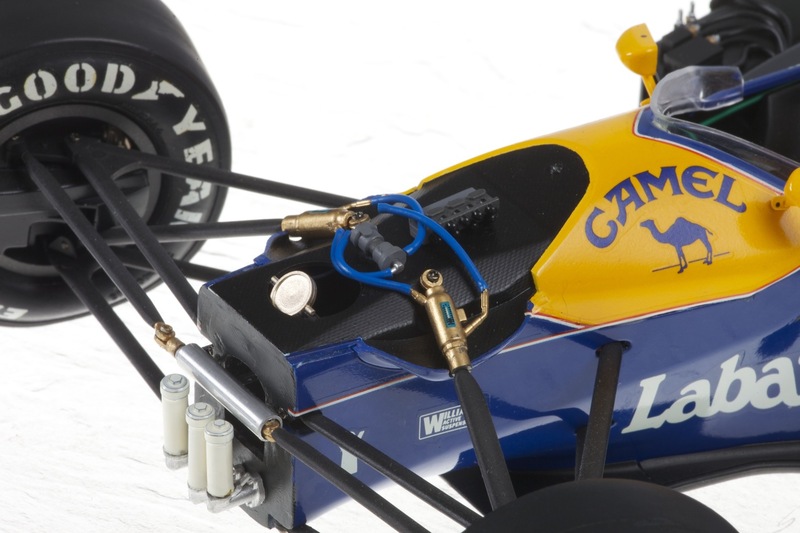 Nigel Mansell’s Championship winning Adrian Newey designed FW14B – so much has been written about this very special car, designed and developed with Nigel Mansell in mind. 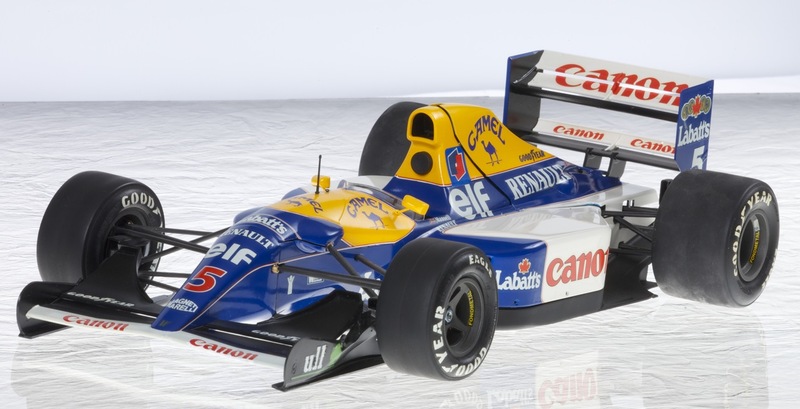 In truth, the car’s predecessor was being designed and developed at a time when Nigel fell out of love with Ferrari in 1990, a year when everything seemed to go wrong for Nigel, both unreliability and the shifting of support within the team towards new driver Alain Prost. In 1989, Nigel had won with the Ferrari 640 at their debut in Rio and again at the Hungaroring and became the darling of the Italian tifosi, naming him ‘Il Leone’. When Alain Prost signed for Ferrari, the 640 was on a developmental rise and the 1990 car (Ferrari 641) was even more successful. 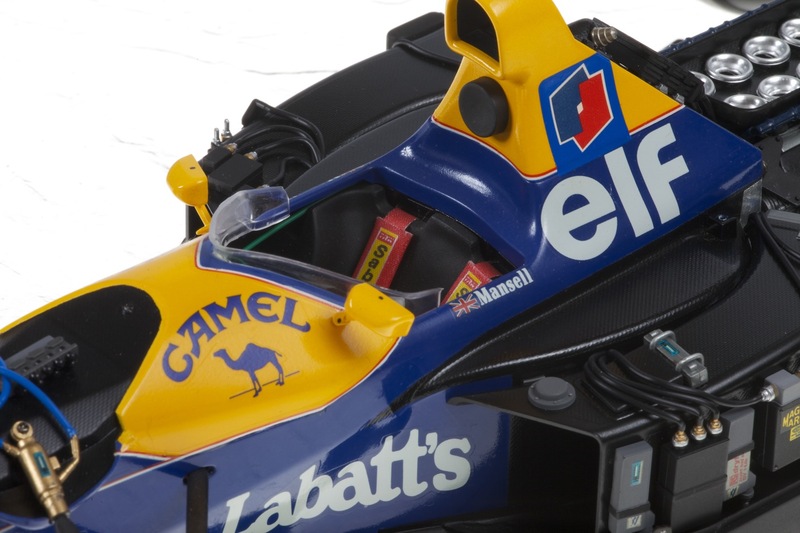 Alain Prost was better able to engineer support from within the team towards his own very realistic efforts at winning the Drivers’ Championship (five wins), which meant Nigel was somewhat sidelined and lost impetus and also suffered unreliability issues, winning only once at Estoril scoring half the points of his team-mate. Gearbox failure at Silverstone whilst leading resulted in him announcing his retirement. After the season-end, many tried to encourage Nigel to go-back on his previous announcement. 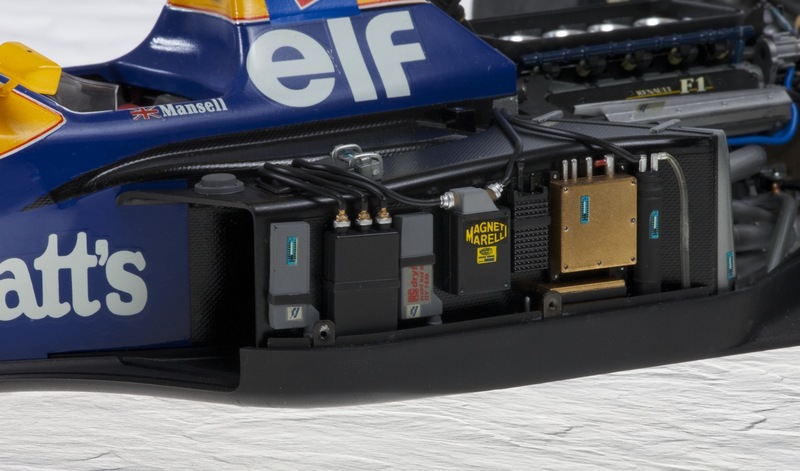 After negotiations on the potential Championship-winning package that Frank Williams was offering, Nigel whole-heartedly got behind the innovative Newey-designed Williams FW14 with its semi-automatic gearbox and active-suspension in development, all the time building competitiveness and reliability. 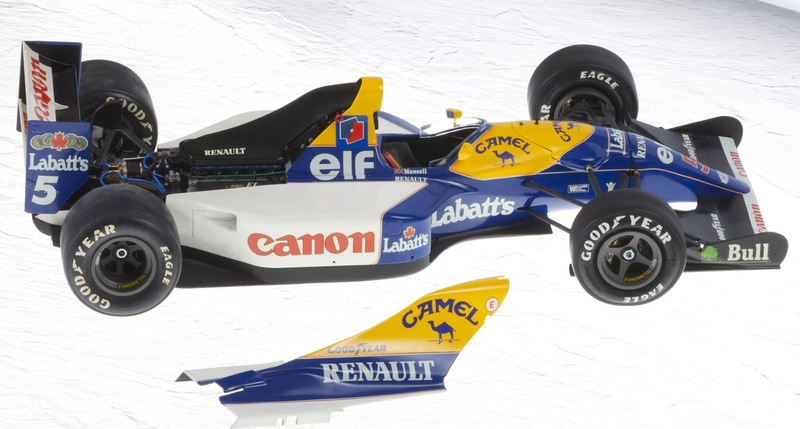 Nigel won five Grands Prix and was second in the Drivers’ Championship to Senna, teammate Patrese contributing to Williams’ strong second place in the Constructors’ title, having added two further wins. 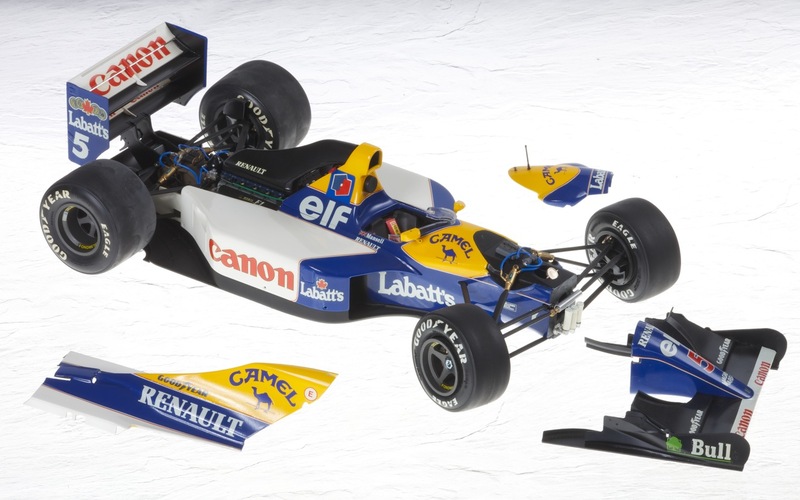 Going into 1992 therefore, the full effect of Adrian Newy’s design genius – the FW14B, was now set-up to be the dominant car run by a top team, best engine and driven by the best drivers. 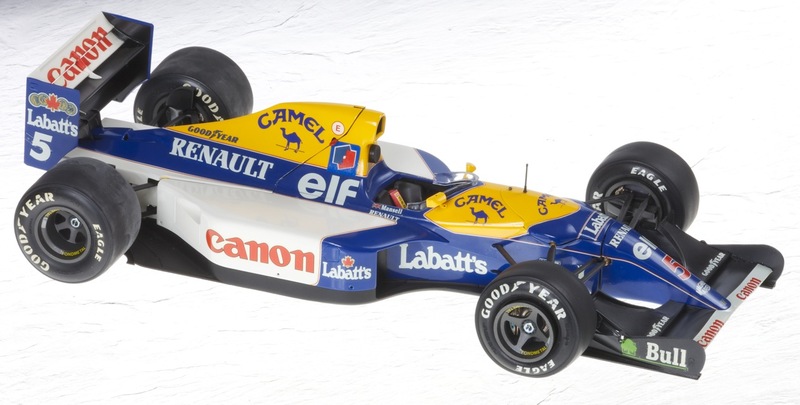 Consequently, Nigel won nine Grands Prix and scored twice as many points as second place Riccardo Patrese who won a further Grand Prix for Williams having also finished second to Mansell six times; the Drivers’ Championship went to Nigel and the Constructors’ crown to Williams. 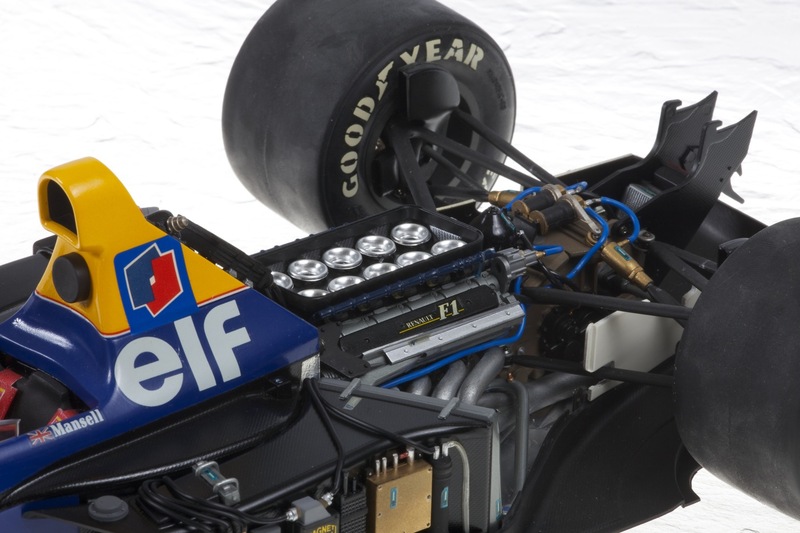 The execution of Adrian Newey’s clinically concise and brilliantly conceived packaging is fully evident in the Williams FW14B, a talent first really seen in the beautifully appointed 1990 Leyton House CG901, a development of his own March 881 design of 1988. 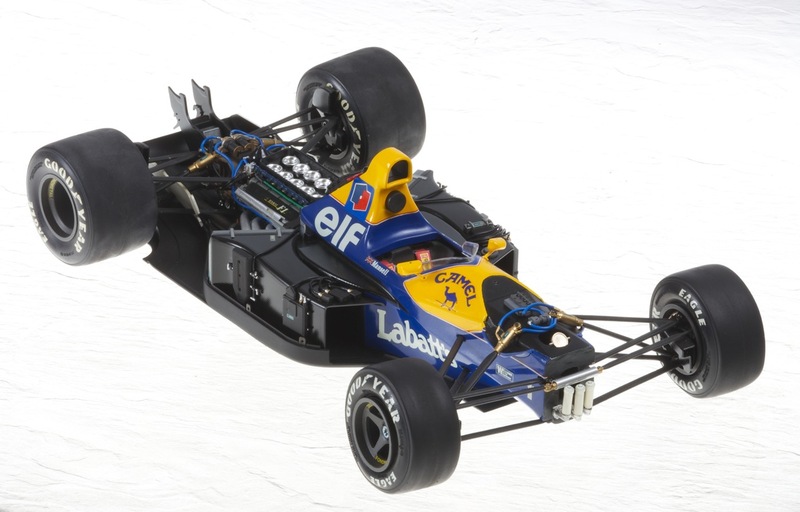 This model built in 1997, was produced ‘in a rush’ in order to complete it by that summer. This was because I had been presented with the Tamiya kit as a leaving present from colleagues at my first place of veterinary employment in Margate, Kent where I’d worked for eight years and gained my Certificate in Small Animal Cardiology. During that first year settling in to my second job in Crowthorne (Berkshire), I felt I had to complete this complex model and send them a photograph by way of thanks. 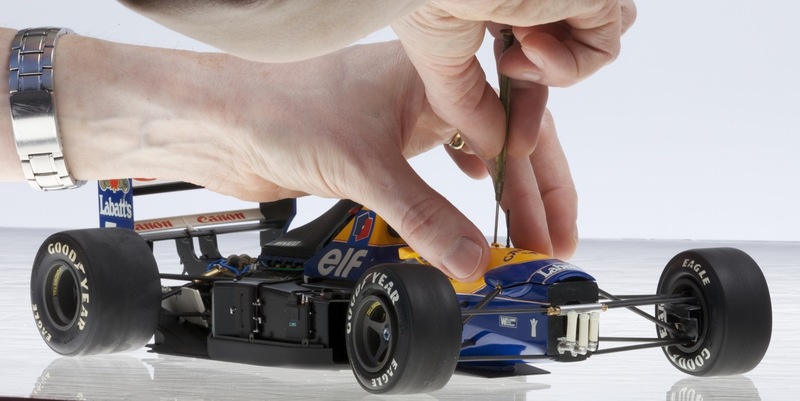 Therefore, whilst not wishing to simply build the kit out of the box, I had to develop ways of enhancing and super-detailing it to make my mark upon it, for I had been super-detailing models since 1990 and carrying out ‘conversions’ of one model into another since 1995. In the time-scale I gave myself and with this large model full of super-detail potential, I decided to split the bodywork (side pods, nosecone and engine cover), also to add detail to the front bulkhead (master cylinders, steering rack and pinion). Beyond that, there was nothing more I could really do in the timescale allowed. I had access to a Tamiya magazine (Issue 35, April/May 1993) which was both very inspiring and mildly depressing at the same time. It was a little off-putting because in recently having moved, I couldn’t complete a build half as good as that depicted in the magazine and had no access to, or experience of carbon-fibre decals for a start. I did produce my own version by photocopying onto thin paper a suitable pattern, ready to apply and lacquer them, however I felt it was better to leave the plastic surfaces (with slight relief), as produced in the kit. It was enough work for me to ensure my ambition with divided body panels and detailed front bulkhead worked well, whilst ensuring a good clean build overall and neat body panel spraying with Halfords spray paints (as recommended in the Tamiya magazine article and new to me). 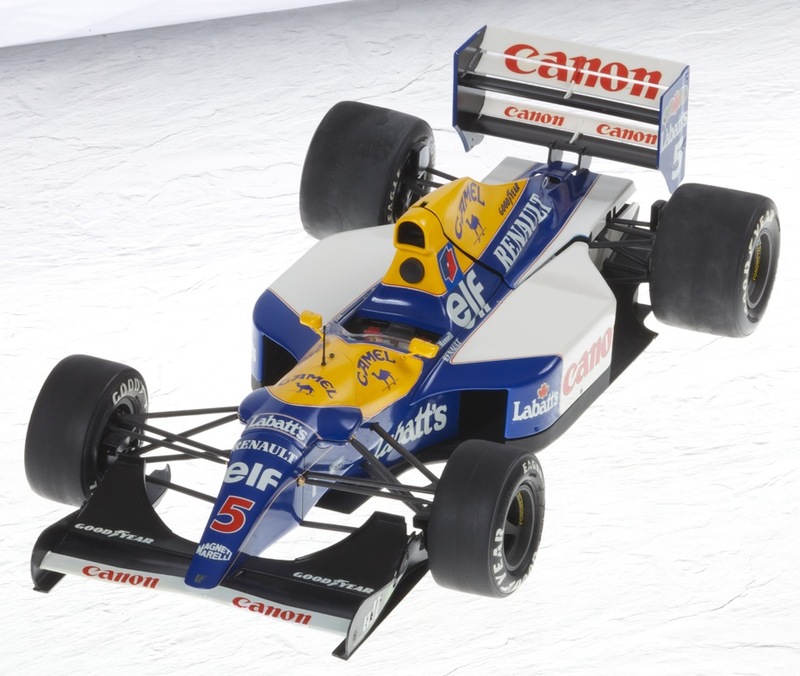 These more modern cars (the Fw14B being one of Tamiya’s trio of 1990’s GP cars, their first since the Renault RE20 of 1980), demanded perfect body paintwork, not my joy and strength I must admit. 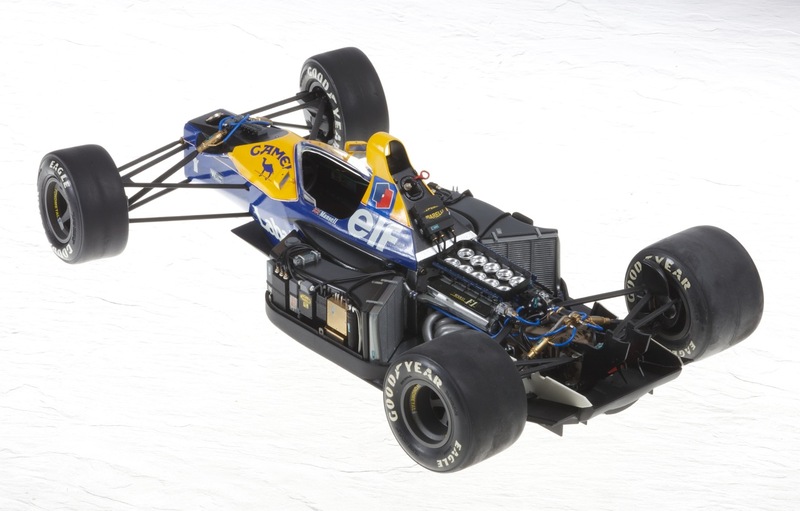 The model was duly completed and was clean and well built, nothing stunning and certainly not as fantastic as that presented in the Tamiya magazine and no where near as good as I’ve seen in various model shows since (especially Model Sport, Model Wheels in the mid 2000’s). 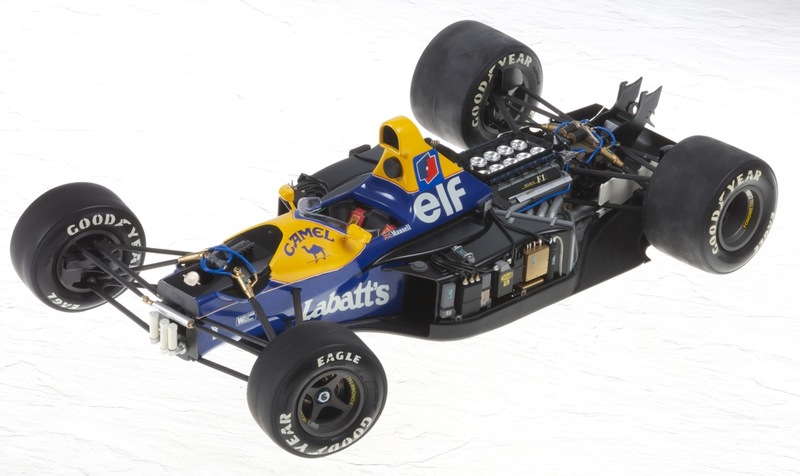 So, I felt I’d completed my remit to finish the model whilst I was still remembered at my former place of work, but it was not approached in the way I would have liked to (slower, more research – very little available at the time I might add, with a lot more super-detailing and attention to detail re the fitting of body panels). Then, I came across Andy Mathews’ work – wow, absolutely breathtaking, made all my former attempts and other better models I’d seen made by others, look amateurish. 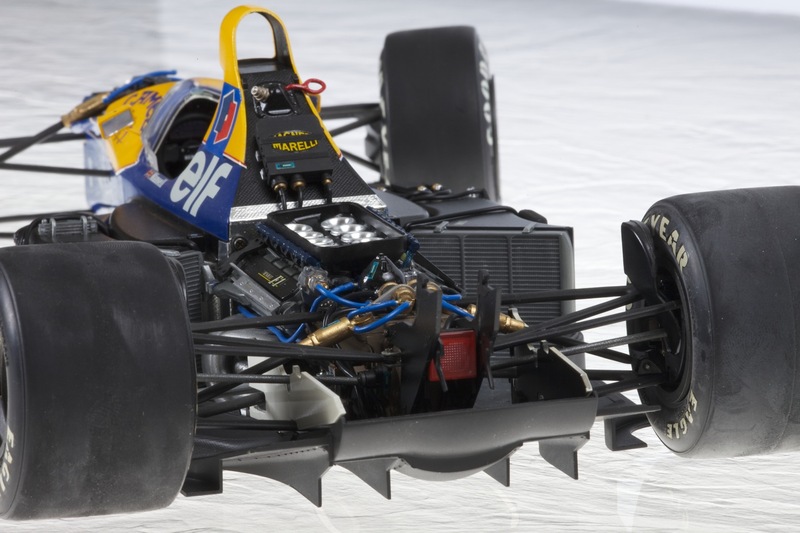 It was an incredible life-changing experience when Andy’s Clear View F1 models came to our PC screens. 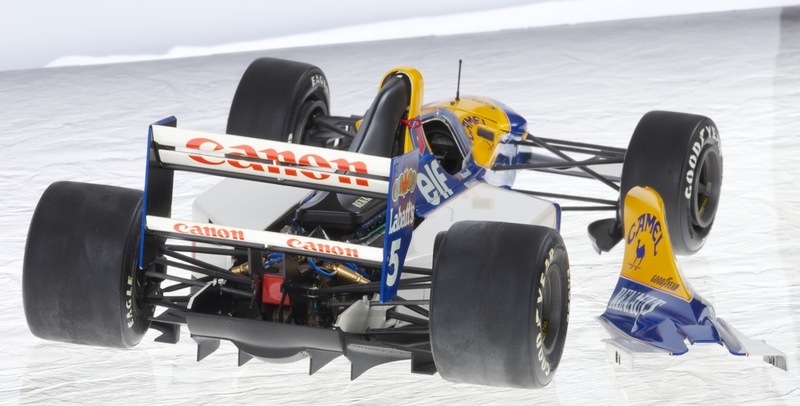 His subsequent book (published in 2005) details the finished model in a sixteen page photographic gallery as completed in 2000, the book otherwise concentrating on the research of this car and the FW14 and the FW15C. His work more than others, has inspired me to new heights of expectation and standards to aim for. For me, Andy’s work is ultra-clean, clinical, almost machine made perfect, beautifully painted and presented and each are gems to look at, reading glasses or even magnifying glasses are required to get the best effect, absolutely beautiful!